Every day, more than a million workers in Mississippi head to work to support their families and communities. They work in industries such as shipbuilding, catfish and poultry processing, steel mills, retail, construction, agriculture, healthcare, auto manufacturing, and furniture and wood products manufacturing. Many of these jobs can be dangerous—where job hazards cause serious injuries. 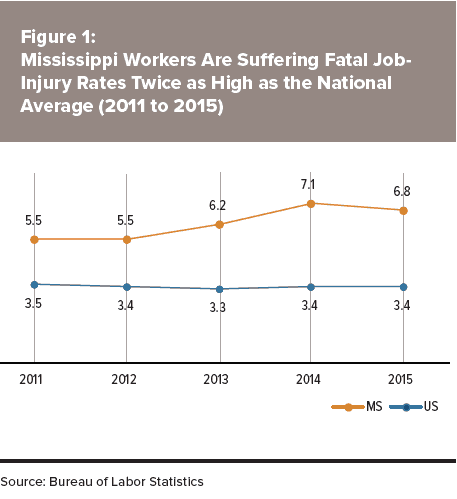 In fact, Mississippi workers face one of the highest on-the-job fatality rates of any state in the nation. Furthermore, Mississippi workers suffer hundreds of severe injuries every year and face a workers’ compensation system where benefits are so low that injured workers and their families are at risk of falling into poverty. “Death on the Job: The Toll of Neglect. 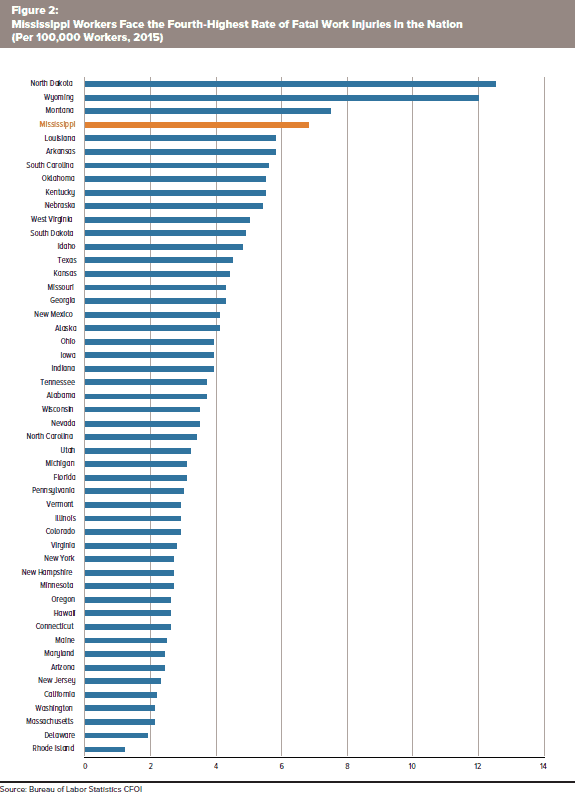 A National and State-By-State Profile of Worker Safety and Health in the United States.” Publication. 26th ed. Washington: AFL-CIO, 2017. Accessed November 17, 2017. https://aflcio.org/sites/default/files/2017-04/2017Death-on-the-Job_0.pdf. “Explosion at Mississippi Shipyard Leaves Employee Critical.” Associated Press, October 21, 2017. Accessed November 17, 2017. http://www.clarionledger.com/story/news/local/2017/10/21/shipyard-explosion-ingalls/788016001/. Groeger, Lena, Michael Grabell, and Cynthia Cotts. “Workers’ Comp Benefits: How Much Is a Limb Worth?” ProPublica, February 27, 2015. Accessed November 17, 2017. http://projects.propublica.org/graphics/workers-compensation-benefits-by-limb. Lewis, Patrick H., Leslie M. Altman, John M. Cerilli, Eduardo “Jim” Cuaderes, Jr., Natalie C. Gros, Harry D. Jones, Bonnie L. Kristan, Eugene Ryu, Michael Salveson, Michael T. Short, and Kimberly Zabroski. Littler’s Workers’ Compensation Retaliation Survey. Report. Littler Mendelson, P.C., 2012. Accessed November 17, 2017. https://www.littler.com/files/WorkersComp_RetaliationSurvey_4-3-12.pdf. McLaren, Christopher F., and Marjorie L. Baldwin. Workers’ Compensation: Benefits, Coverage, and Costs. Washington, DC: National Academy of Social Insurance, 2017. Accessed November 17, 2017. https://www.nasi.org/sites/default/files/research/NASI_Workers%20Comp%20Report%202017_web.pdf. United States Department of Labor. U.S. Bureau of Labor Statistics. “News Release: Employer-Reported Workplace Injuries and Illnesses–2016.” News release, November 09, 2017. Accessed November 17, 2017. https://www.bls.gov/news.release/osh.htm. United States Department of Labor, Occupational Safety and Health Administration. Establishment Search. Accessed November 17, 2017. https://www.osha.gov/pls/imis/establishment.html. United States Department of Labor, Occupational Safety and Health Administration. Inspection Information. Accessed November 17, 2017. https://www.osha.gov/pls/imis/inspectionNr.html. United States Department of Labor. Occupational Safety and Health Administration. Severe Injury Reports. Accessed November 17, 2017. https://www.osha.gov/severeinjury/index.html. United States Department of Labor. OSHA Enforcement Data. Accessed November 17, 2017. https://enforcedata.dol.gov/views/data_summary.php. United States. United States Department of Labor. U.S. Bureau of Labor Statistics. Census of Fatal Occupational Injuries (CFOI) – Current and Revised Data. Accessed November 17, 2017. https://www.bls.gov/iif/oshcfoi1.htm. United States. United States Department of Labor. U.S. Bureau of Labor Statistics. Fatal Occupational Injuries, Total Hours Worked, and Rates of Fatal Occupational Injuries by Selected Worker Characteristics, Occupations, and Industries, Civilian Workers, 2015. Accessed November 17, 2017. https://www.bls.gov/iif/oshwc/cfoi/cfoi_rates_2015hb.xlsx. United States. United States Department of Labor. U.S. Bureau of Labor Statistics. Fatal Occupational Injury Rates by Industry, 2015, Mississippi. Accessed November 17, 2017. https://www.bls.gov/iif/oshwc/cfoi/rate2015ms.htm. United States. United States Department of Labor, Occupational Safety and Health Administration. Adding Injury to Inequality: The costs of failing to protect workers on the job, 2015. Accessed November 17, 2017. https://www.dol.gov/osha/report/20150304-inequality.pdf.